Despite polarizing reactions from fans, Disney is continuing their live-action Disney remakes with three scheduled for release this year. The first is Dumbo in March, then Aladdin in May, and Lion King in July. Aladdin just outed its next sneak peek. While only a minute long, it still showcases plenty to curious fans. The trailer features characters like Jafar, Jasmine, and Abu along with peeks of set pieces including Prince Ali’s musical number and the Cave of Wonders piece. However, the biggest element fans were curious about is how Will Smith is going to look like as the iconic Genie, originally played by Robin Williams. 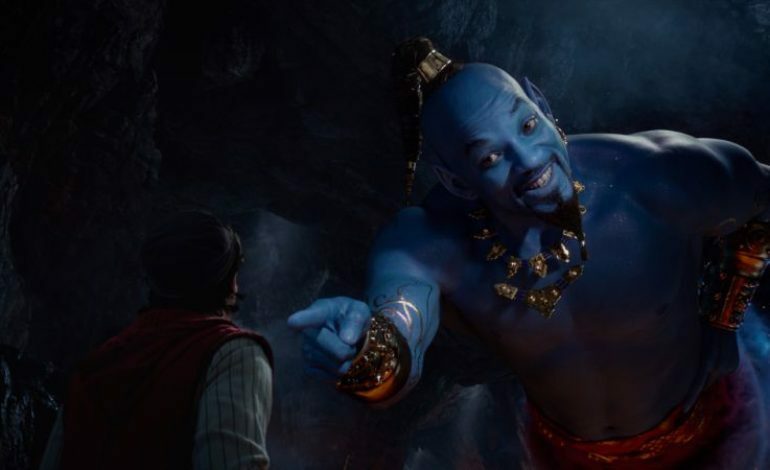 The end of the special look exhibits Will Smith as the Genie in his blue CGI glory. Initially, fans were confused about why Will Smith isn’t blue and genie-like in any of the pictures from earlier promotional material which showed Smith in human form. Now, one gets a good look at Smith as the Genie but fans are questioning the quality of the motion capture in this particular case. It also doesn’t help that many are saying Will Smith is trying to do the impossible by recreating a role played by someone as iconic as Robin Williams. Or that they’re harping on the fact the original Aladdin was famous for its beautiful animation and how hard it is to recreate something as expressive in live action. Regardless of how the live-action version will be, fans will always have the animated Aladdin by their side.